In this post, we will differentiate the difference between the surface area and volume, but later on we will focus only at the surface area. Firstly, what is surface area? Surface area is the total area of all the faces of a 3D object. Lastly, what is volume? Volume is the measure of the amount of space in a 3D object can occupy. So we did an activity about finding the surface area of those 3D objects. 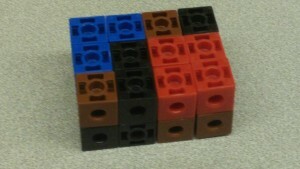 We also built objects that looks like them exactly, so we’re going to solve the surface area. 1 unit; 3 width; 2 height; 4 length. Deoxyribonucleic acid (DNA) is a nucleic acid that contains the genetic instructions or information for the development and function of living things. The structure of the DNA is a double helix. Imagine a ladder and imagine it twisted. It almost looks like it. • Explain what the following parts of the model represents. Licorice: The two strands of the DNA and some of its part represents the phosphate. Toothpicks: The excess toothpick part which went through the licorice represents the sugar that’s present in the DNA and the toothpick part inside the model represents the nitrogen which is present in all of the 4 bases. • Did this activity helped me understand DNA structure? Explain why or why not. It helped me understand the structure of DNA almost completely, the bases pattern, etc. because this activity made me understand how the DNA looks like by making us build an example model of the DNA structure. However, there is a flaw in this structure since the sugar should completely dominate the two strands of the DNA. The season where a new red thread is made. As she stared over the dancing flowers. In a colourful flower field. Love and the beauty of spring. a poem makes me feel more free.